Some years back my wife introduced a new principle called “Close the Circle” into our house hold. It was something she had read about somewhere on the www (unfortunately, neither of us can find the original reference). Closing the Circle means that you finish your job before moving on to the next. Our interpretation is that you always clean up after you have done something. Some examples: You do not leave the dishes for the next day, you make your bed in the morning, and you clean the bit after going horse back riding (free tip: Always mention horses in your blog ). Needless to say, we keep a pretty tidy home. Of course there will always be jobs that cannot be finished in a short period of time. They may take weeks or months to complete. But you may be able to break the job into smaller task where each can be completed in a shorter time. For example, the last couple of months I have been putting up new fencing for our horses (there, I did it again) during the weekends. Each Saturday morning I set new goals for the weekend and when the weekend closing I set my tools aside and made sure everything looked tidy. I like to apply the Closing the Circle principle to coding as well. should have made a push to your remote repo and maybe even a pull request with the coded solution for the task including passing unit tests and updated documentation. I am not saying this is what I always do. I am just saying that is what I strive to do and I think it is something that will keep your code tidy and give you a better work life balance. With the Mojave update to macOS, Apple has introduced a couple of restrictions on what your apps are allowed to do. If you are the developer of apps that are downloadable outside of the Apple App Store you need to be wary of these restrictions. The two new restrictions I will be talking about in this article is the Automation and Full Disk Access restrictions. The new restrictions on Automation will prevent apps from scripting other apps through AppleScript and the Full Disk Access will prevent apps from manipulating files owned by other apps. In these scary times of the World Wide Web it is probably a very good idea for Apple to add these restrictions to the OS. But I do think that Apple has done it in a not very user friendly way, especially when it comes to Full Disk Access. Unless the user has specifically given Full Disk Access to your app, it is not allowed to change files not owned by itself. If you try you will get an error telling you that it is not allowed. That is a good thing! You should not be allowed to mess up things for everybody else. The problem is that Apple has not given us an API to prompt the user to give access. There is not even an API for checking if we have access to a file. The user is in for a bad experience because they have to manually give Full Disk Access to our app in the Security & Privacy panel. That is absolutely terrible! Most users I have met have no clue on how and where to find the .app file or the security center. You have to write a thorough user guide to help the users and who reads user guides these days? Fortunately, Apple has done a better job when it comes to Automation. Mojave will stop you if your app tries to access another app through AppleScript. This too is a good thing. Imagine the mess a malicious app could do! Fortunately, Apple has done better when it comes to usability than they did with Full Disk Access. All you as a developer need to do is add the key NSAppleEventsUsageDescription to your app’s plist.info file with a description. The first time the app tries to script another application, the runtime will automatically prompt the user for permissions. Of course, you have to make sure that your app gracefully fails if the user denies permissions. If the user grants the permission your app is added to the Automation tab under Privacy & Security settings. Note how there is no way to add an app manually to the Automation tab. Shame on you, Apple! Beware that if you need a hardened build for notarisation, the good people of Apple have in all their glory decided to completely ignore the NSAppleEventsUsageDescription property unless you also specifically enable Apple Events in the Capabilities tab in Xcode. While I think it is a good idea to restrict permissions for macOS apps installed outside of the App Store, I do believe that the user experience is terrible. How many users know the consequences of granting permissions to full disk access or to Apple Events? Nobody knows what those terms mean. Apple is also making it very hard for developers to properly instruct the app users. When I first started using Git a while back it seemed pretty straight forward although I had to get used to the disconnected nature of Git which is different than how TFS works (or used to work). I mostly used Visual Studio’s Git integration and usually it worked like a charm. But then after a while things started to get complicated. I had to work with submodules, change the remote URL, and handle untracked files. That is when I decided to move out of my comfort zone in Visual Studio and into the Git CLI. The Git CLI is not easily remembered and everything can be done in more than one way so I started my own compilation of useful commands. Below is the result of that compilation. I hope it can be hopeful for those of you going through the same process and please let me know if you have any Git gems of your own that belong on the list. In no specific order whatsoever. On Windows the Git configuration file is usually placed under “c:\Users[user]”. You can also start an editor from the command prompt. To change the default editor for commit messages to Notepad++, add a [core] section to the config file looking like this. From now on Notepad++ will open when ever you run git commit without the -m switch. If the repo contains submodules, and you want to bring the code in the submodules down, you’ll need to clone recursively. If you have cloned a repo with a submodule and you want to change the submodule to a different fork (if for example you have forked the submodule), you need to edit the URL in the file .gitsubmodule. After saving .gitsubmodule, run the command. It seems that this may detach from HEAD, so a checkout may be necessary (before making any local changes). If there is a merge tool, you can start your merge tool (set in the config file). If you are tired of typing long hard-to-forget commands you can create aliases. git config --global alias.a "add ." git config --global alias.c "commit"
You can now just type git a to add unstaged files. Aliases can also be added directly to the config file. If the compiler refuses to compile your code, then by all means read the errors messages. They may be cryptic but you might as well get used to them because it won’t be the first time you see them. There are lots of great articles on how to know your tools to be a better programmer. I thought I’d chip in give and give 10 tricks on how to be a good Windows user and hence also a better developer. These tricks are very simple and have been part of Windows for a while (some even before Windows 10) and yet they are unknown to many Windows users. There has always been an ongoing war on whether macOS or Windows is the better. I am a user of both and I love and hate both of them (although I am more effective on Windows). I hope the following tricks can be of help to Mac users who sometimes need to use Windows, and also of help to existing Windows users who perhaps can learn a new trick or two. I would be happy to hear about what tricks you use to make life easier so please join in on the comments. These tricks all apply to Windows 10. For some reason the default setting in Windows is to hide all known file extensions. So, the first and most important trick is to get Windows to show all known file extensions in Windows File Explorer. For example, I had a client that stubbornly claimed that double-clicking the MyApp.exe file would only show some gibberish in Notepad. After a while it occurred to me that the standard .NET configuration file MyApp.exe.config file showed as MyApp.exe on the client’s machine because the file extension .exe was hidden. So, the first thing you do on a new Windows box is to open Explorer, click Options -> Change folder and search options. Go to the View tab and clear the check box for “Hide extensions for known folder options”. The second most important trick is the “Run” command in Windows. Mac has its very useful Spotlight Search, and Windows has its equally useful Search feature in the Start menu, but I find the Run command much more useful. The Run command allows you to run one-line command line instructions. You get to the Run command by typing Windows+R on the keyboard. That will open up a small dialog to the lower left where you can type any command. I already mentioned it above, and I will mention it again. Few people realize that Windows has built-in search similar to Mac’s Spotlight search. Just press the Windows button on the keyboard to open the start menu and start typing immediately. This will search for apps and files and the search results show immediately on the start menu. It evens searches tags in images and content in pdf files. I actually never understood the hatred for Windows 8 and 8.1 and the large start menu. To me it was just a big friendly searchable start screen. But I guess I was the only person in the world that liked it. Unfortunately, Windows Search does not search the internet. The power menu is shown when you press Windows+X on the keyboard. The power menu gives you immediate access to the most important stuff such as settings, event viewer, network connections, and the command prompt. Speaking of the command prompt, if you prefer to use PowerShell, you can replace the command prompt with PowerShell on the power menu. Right-click your taskbar and choose taskbar settings. Then turn on the setting “Replace Command Prompt with Windows PowerShell in the menu when I right-click the start button or press Windows-key+X” (now that’s a long sentence). As you know you can start an app by clicking its icon on the taskbar. Now, if you want to start more instances of the same app, you hold left-Shift and click the icon. And if you want to start an app as administrator, you hold left-Ctrl and left-Shift and click the icon. You should pin command prompt and PowerShell to the taskbar so that you can start and administrator prompt just by left-ctrl + left-shift + clicking it. You can also start an app that has been pinned to the taskbar simply by holding the Windows key and pressing the number for the app. So, for example, Edge is the third app om my taskbar, so I can start it simply by pressing Windows+3 on my keyboard. This tool is very helpful for capturing screen shots and I use it all the time, for example for writing blogs. Just search for “Snipping” in your start menu to use it. Start the Snipping Tool and click New. Press the Esc button on your keyboard. Open whatever menu you wish to capture. Press Ctrl+Print Screen on your keyboard. Now you can draw a rectangle of with the Snipping Tool to capture the menu. Left-shift and right-click a file to reveal a number of extra items on the context menu. One of them is “Copy as path” which will copy the file’s full path to your clipboard. Neat. By the way, if you grab a window by the title bar and shake it with the mouse, all other windows on the desktop will be minimized. With Windows search and the run command, who needs icons on the desktop? Add shortcuts to the taskbar for the apps that you use the most for easy access and leave the desktop clean and uncluttered. The last trick for now is for developers. I find it incredibly useful and I have not met a single person who knows about it since I learned it many years ago. So I decided to include it here as a small bonus for those who made it this far. I can never remember the syntax or the property names for connection strings when connecting to a database from code on Windows which is why this trick has helped me for years. A long time ago at a conference (in Boston I believe) I saw the presenter creating a file on his desktop with the extension .udl. Then he double-clicked the file which opened a small dialog where he entered SQL Server instance name and selected authentication and database name. After dismissing the dialog he opened Notepad (by pressing Windows+R and entering “notepad”) and he then dragged the .udl file to Notepad, revealing a beautiful connection string. How about that! By the way, the .udl trick won’t work unless you have followed the very first trick on this list: “Show file extensions in Explorer”. If there is one thing that Team Foundation Service (TFS) does really well, it is the use of work items. A work item can be a lot of different things. For example, it can be a bug, a task, a user story, an epic, or a test case. It can even be a request for a code review. You can define relations and dependencies between work items and you can assign work items to changesets (commits). The possibilities seem endless. The work items available to you are decided by the template that your admin chooses for you when she creates a so-called team project. At work we have been using TFS since the dinosaurs walked the earth. Back then TFS was a whole lot different than it is today which means that the templates looked a lot different. For example, the template used for the team project we are using on my team is based on some old Microsoft Foundation framework which only allows bugs and tasks. I does not allow us to create cool things like user stories or code review requests. Export the work item templates from TFS. Edit the templates if necessary. Import the templates to TFS. Sounds easy, right? Well, it’s not hard but it is kind of cumbersome. Changing the work item templates is only possible on on-premise TFS. Don’t try this on Visual Studio Team Services (at visualstudio.com). Work item templates (WITs) are defined as XML-files so first you want to export the XML-files that you want to use from TFS. The export is done through Visual Studio and the tricky part is that you need to do it from a Visual Studio version that corresponds to your TFS version. So, in my case we are on TFS 2015 so I need to do the export from Visual Studio 2015. To export the WITs go to the menu Team –> Team Project Collection Settings –> Process Template Manager. Here you need to decide which template you wish to upgrade to. If you want to upgrade to the “Agile” template, then that is the one you should download. Click the “Download” button to download the XML-files. 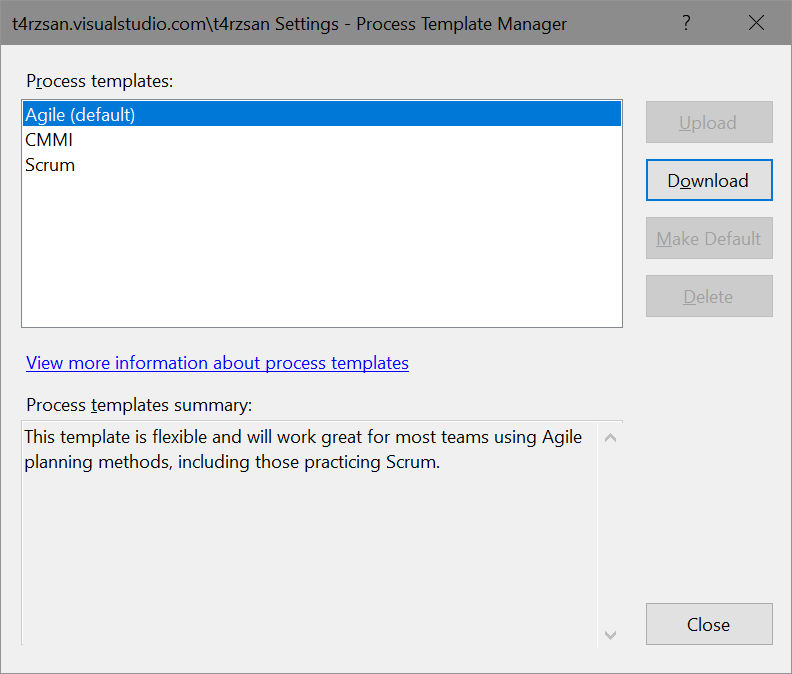 If you chose to download the “Agile” process template, the files will be placed in a subfolder called “Agile”. The interesting files for WITs are located under “Agile\WorkItem Tracking”. 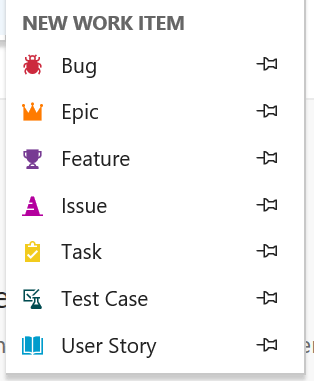 If you take a look at the files in the folder “Agile\WorkItem Tracking\TypeDefinitions” you will see that there is an XML-file for each work item type, for example Bug, UserStory, Task, TestCase, CodePreviewRequest. The files define the fields and states for the work items. These are the files that you need to import to our legacy team project to upgrade it to a newer process template. So let’s start importing the work item templates. Unfortunately, I have been unable to find a way to batch import all the files in one shot so you have to do it one file at a time. witadmin importwitd /collection:"http://mytfsserver/tfs/MyCollection" /p:"MyTeamProject" /f:"C:\downloadedtemplates\Agile\WorkItem Tracking\TypeDefinitions\Bug.xml"
witadmin importwitd /collection:"http://mytfsserver/tfs/MyCollection" /p:"MyTeamProject" /f:"C:\downloadedtemplates\Agile\WorkItem Tracking\TypeDefinitions\CodeReviewRequest.xml"
witadmin importwitd /collection:"http://mytfsserver/tfs/MyCollection" /p:"MyTeamProject" /f:"C:\downloadedtemplates\Agile\WorkItem Tracking\TypeDefinitions\CodeReviewResponse.xml"
Business Value - Microsoft Visual Studio Scrum 1_0' to 'Business Value'. If fixed the errors by manually editing the XML-files. In the above case I searched for “Business Value” in the XML-file that failed and changed it to “Business Value – Microsoft Visual Studio Scrum 1_0”. It didn’t seem to matter anywhere in TFS after the import. After all the WITs have been imported (without errors!) the final step is to import the categories. For example, the file categories.xml define which work items can be created directly by the user in TFS, and which work items are hidden, such as code preview requests that are created indirectly through code review requests in Visual Studio. witadmin importcategories /collection:"http://mytfsserver/tfs/MyCollection" /p:"MyTeamProject" /f:"C:\downloadedtemplates\Agile\WorkItem Tracking\Categories.xml"
And that’s it! Now you should be able to create all the fancy Agile work items from within TFS, and you should be able to request code reviews from Visual Studio.